The Lieutenant Governor hosted a reception at Fort York National Historic Site in honour of His Royal Highness, The Duke of York, who was undertaking a visit to Ontario. As Colonel-in-Chief of The Queen’s York Rangers (1st American Regiment), the Duke of York participated in the Trooping The Guidon Military Parade. The Lieutenant Governor, who is Colonel of the Regiment, also was in attendance. The Queen’s York Rangers “Trooped the Guidon” in the presence of their Colonel-in-Chief. His Royal Highness the Duke of York to officially recognize five new battle honours bestowed on the Regiment. These Honours include: Defence of Canada 1812 – 1815, Detroit, Queenston, Niagara, and Afghanistan. The “Old Guard” consisting of The Queen’s Rangers Historical Guard, The King’s Royal Regiment of New Yorkers, The Queen’s York Rangers and the Incorporated Militia Of Upper Canada paraded with the Regiment and their Cadet Corp for the Trooping of the Guidon on Thursday June 5, 2014 at Old Fort York. We were indeed honoured to be invited and included! This past weekend saw members of the Incorporated Militia of Upper Canada and their Campfollowers supporting two events in Ontario. The bulk of the regiment were camped out for the 201st anniversary of the Battle of Stoney Creek. This is always one of our favourites with a good showing from the members. 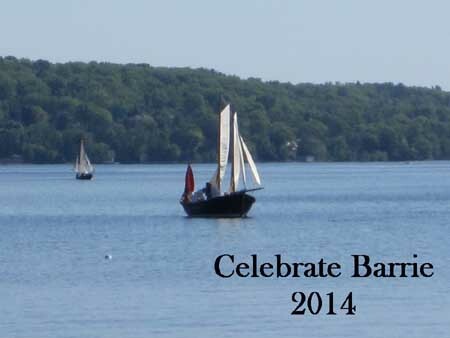 At the same time as the Battle of Stoney Creek, Celebrate Barrie was underway on Kampenfelt Bay. This event we have historically supported l and were glad that some of our members were able to support it as well. 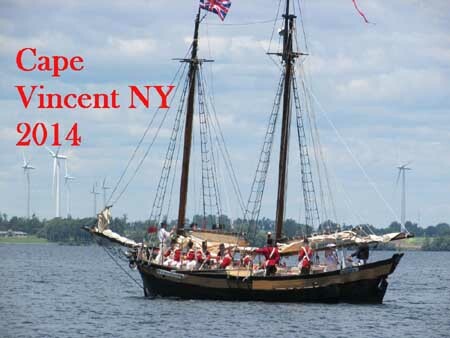 What a perfect weekend for a raid on Cape Vincent NY! With the help of the Canadian Voltigeurs, The Canadian Fencibles, and a lone Glengarry Light Infantryman, the Incorporated Militia of Upper Canada came from the lake, and attacked the town. 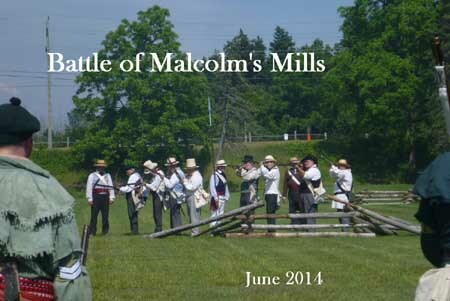 We were eventually driven off by US troops and militia including The US 15th and Forsythe’s Rifles. The three ships/gunboats involved included the Owl and La Revenante The hosting town and chamber of commerce, could not have been more gracious in letting us participate in their War of 1812 bicentennial celebrations. Cape Vincent’s proximity to Wolfe Island with ferry connections to Kingston made it a strategic location during the War of 1812. In October, 1814, an invading American force of about 700 men under Brigadier-General Duncan McArthur advance rapidly up the Thames Valley. He intended to devastate the Grand River settlements and the region around the head of Lake Ontario which supplied British forces on the Niagara Frontier. McArthur reached the Grand ad after an unsuccessful attempt to force a crossing, attached a body of some 150 militia here at Malcolm’s Mills (Oakland) on November 6th. Canadian forces, comprising elements of the 1st and 2nd Norfolk, 1st Oxford and 1st Middlesex regiment, put up a spirited resistance but were overwhelmed.